I had an incredible roundtable discussion last week with a group of business owners who I regard so highly. It was amazing to hear what is coming up for them around health and wellness, so I’m going to share some of the questions we covered so you can see what comes up for you. I’m sure some of these will sound familiar. 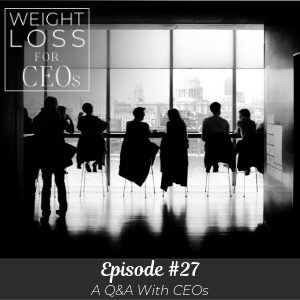 They shared their questions with me, and some of the realizations they were able to come to, really looking at their thoughts around food, exercise, and how they approach everything around wellness, are truly eye-opening. Join me on the podcast this week and discover how your brain takes the lead when it comes to making excuses about the volume of your workouts, how to make some of the big commitments you have to make seem less intimidating, and how to develop new healthy habits that will create lasting change in all areas of your health. I answer these questions as a coach, so this is a great insight into the practice of coaching and how it could help you! If you need a little help getting to grips with some of the concepts in this episode, download my worksheet! And if you have a question about these topics, or anything related to health and wellness, please, send me an email and I will feature it in a future episode! How we place negativity on taking time out of our busy work lives to concentrate on our wellness. Why we make excuses about not having time to workout when we always find time to watch Netflix. How to make food-prep for the week a less daunting task. Why we have to allow and embrace the discomfort of developing new habits. What you can do to choose to put yourself first, before your other responsibilities. How to stay in real motivated energy when you’re not seeing instant results. Why setting yourself big challenges and using willpower to drive through will not create lasting change. Oh hello, friends. I have something kind of delicious for you today. Don’t you love food analogies from the wellness coach, the weight loss coach? I had an amazing roundtable discussion last week and this was with a group of business owners; women I highly respect in the community in Atlanta. And we gathered for breakfast to talk about wellness. I guided the discussion and I learned so much, but really, I didn’t hear anything new. And that is what I want to share with you today. What I want to do today is really handle what I saw come up for so many of these successful business owners and what they brought to the table of their concerns, their challenges, and what happened for them is really a clear understanding that they weren’t alone, that they shared a lot of the same challenges, but also that there were some really easy ways to kind of climb out of the frustrating moments around food, exercise, all the things; all the things of remaining well while you’re running a business. So I am going to handle this a lot more like a Q&A so that you get the full benefit and actually feel like you were at the table. So I want to invite you in. Imagine you’re walking into a room with me and we’re going to talk about everything that frustrates you around taking care of yourself and being a business owner. And I know they won’t surprise you, the themes of the morning wrapped around having enough time, making wellness a priority when the business is so important, getting motivated, and handling all of the should in our life, like why do we have all these should conversations in our head? We think they come from outside. And actually, this is like the second time I’ve recorded this podcast because I went really deeply thinking about the time and they should, but I really backed off of this and realize that what I want you to hear are these little nuances and all the different ways that your brain offers, that are so common to all of us, offers excuses or obstacles. And what I want you to be thinking during this entire podcast is, and this might be a little uncomfortable and it’s okay, but what I want you to be doing is allowing all the thoughts to come up, all the obstacles in your mind, all the reasons why really buckling down and taking really good care of your body, not in a stringent way but in a really powerful way, what comes up in your mind that prevents you from doing that? And that is the essence of being coached around wellness and not just following a plan. Alright, so I’m just going to go through these issues and coach it out; give you what I would share with you if you brought this to me and we were coaching. And, of course, I can’t go as deep as I would normally in a coach call because this would be a three-hour podcast. But I will give you something that you can walk away from each issue, and especially those ones that you go, “Wait, that’s me,” you’re raising your hand, listen closely and see what I would recommend. Okay, so this is a great opportunity for us to have the most insight on what is challenging as a business owner. Alright, the first – I love this, and what I want to tell you, these are from the questions that they shared in email, and then we covered those while we were together. So it gave me an insight, but I went back read all of the emails and this is what was submitted. The brain is offering these two, like, really go ahead, get well, go run, go shopping, go cook fresh food, or abandon your CEO responsibility. So, this what our brain does first. It leans to negative. And it will get triggered when we are trying our best efforts to do maybe something new in a routine. And it’s just a lie, because what do we really know? We know when we invest time in things that are really important, and especially our wellness, it gives us energy back tenfold. We are paid back, I would say, tenfold when we invest in our wellness. And it’s in energy, mind-clarity, so many things. So, I want you to see how interesting our brain can be and how dramatic. Another one was submitted about time and that was about priorities. It’s tough to make working out a priority, and she even admitted in the question that she finds time to be a couch potato, like, time to sit on the couch. Isn’t that fascinating that we’ll define that we don’t have enough time, we work all the time, but then we really don’t look seriously at what’s going on because we feel like we need to relax or we need to have zone-out time or we’re buffering because we want to watch Netflix instead of working out. And it’s just our brain giving us an opportunity to decide what really is important to us and put those times on the calendar and follow through, even though the brain will say, “Yeah but wouldn’t you rather be watching Netflix?” When you know, in actuality, that what you really deserve is getting a high-energy workout, working out that stress almost chemically out of your body as well having really good energy for the work that you’re doing. And my suggestion, if this came to me in a call, the first thing would be to honor the time on your calendar no matter what. Make it realistic, not every day. If you’re not working out right now, make it three days and honor that time no matter what. And your brain will argue with you. And every time it argues with you and you ignore it, it will stop bringing up the argument, I promise. Alright, so another really great one is, “I just don’t have enough time to do food prep all day on Sunday.” Now, this activity, if you can work it into your life, is amazing, if it works. And what I’ve found in even some client conversations, and there were two people that brought this to the event, is that it’s too big. I don’t like spending a whole day on my weekend in one project, but I don’t mind breaking that up. So, something that I love doing and I recommend is Sunday-Thursday flyover. And this is a calendar routine. And if you are a food-prep person and you’re an exercise-planner, which I highly suggest that you do, planning ahead and then honoring those commitments no matter what to kind of get your motivation rolling, but break it up. So, if it is easier to shop every couple of days, do that. You’ll waste less food. If that food prep Sunday sounds ideal and you try it and it doesn’t work, tweak it. Do it twice a week, or split it up and eat like a European and shop every day. Do what is easiest for you. But my recommendation is, on Sunday night, you look at your first few days of the week. Do you have a lot of meetings? What do you need to put in there to support you? Not to make another thing to do, you don’t have time. And I’m believing that thought, you don’t have time, but I know CEOs and you have a very small margin of time, and that’s a truth. But to maximize it, make a decision on Sunday what your food looks like for a few days. Wow, you’re eating out a lot? Then really choose great restaurants and make some decisions ahead of time about what you’re going to eat. And maybe cook fresh once if you have a fresh meal, and those leftovers can last you until Thursday. Then, look again at Thursday, what does your weekend look like, are you going out a lot? Like, when they ask you what restaurants you want to go to for the weekend, definitely put your two cents in and offer one of the healthy ones, because if you’re dining out all weekend with friends, take control of those situations. So this Sunday-Thursday flyover really is two components. It’s breaking up the week a little bit and if you planned one healthy meal and one workout in those planning sessions, you would have two workouts and two healthy meals that I know would give you further than just those two instances. Then we have leftover food and we create some momentum in working out. So I highly recommend this when the project that you really ideally would like to do seems too big, bring it down to a smaller piece. The other questions rolled into, “We know that there’s some wellness habits we’d like to establish, but we’re not making them our priority.” Again, you’re not committing. You’re not putting them on your calendar and doing them no matter what. So it will take a little bit of that, and that creates some discomfort. Now, that is the most powerful thing, allowing the discomfort, the brain-chatter that comes in when you do something new. But if you’re doing a challenge – and I do love 21-day challenges – I have a client that is doing a 21-day challenge on eating to plus-two. She knows that’s the most powerful place for her to start and she is just focusing on that. And I have other clients that they want to have a daily quiet time, but they’re just not getting to it. Your brain will say you’re abandoning your CEO responsibilities, remember that first thought that we talked about? The brain will offer all sorts of ideas about why this isn’t a good idea, but you know you want to have that quiet time. And we could go on and on about how meditation and taking those opportunities are really good for us. But your brain is going to offer negative thought; that’s its job. It’s trying to take care of you. It’s just not serving you if you don’t manage it. So, if your priority is a daily quiet time, then put it on your calendar a minimum of five of your seven days and stick to it no matter what, set a very short timer, and start small. If you are up to the point of meditating 20 to 30 minutes, then I want you to set a five-minute timer. But do it no matter what. And for 21 days five days out of seven, do that. And before you know it, the meditation time, you’re going to find your sweet spot and really know what to do. You’ll know what your guideline, what your baseline is for you. Another common conversation I have around priorities is this one. Another client said, “You know, I always choose to put others first.” And she really wrote this beautiful paragraph that you could tell she was watching her mind. She’s not even a client. It was like, how smart was this that she saw? She said, “I choose to put others first, but I know that I am truly just not making a commitment to me.” She can see her mind not making the decision. So it really will take a decision and understanding your why. So often, and I’ll just lend some common examples, why do you put others first? You might not really understand why you do and you get frustrated. And almost, if you’re finding you resent others, this is a time to really start looking at it. so if you find everybody else gets to their sport practices, if you’re raising a family, your husband gets his food done, you cook for him, and you’re working fulltime, you’re a CEO and everybody else is getting taken care of except you, there is a reason. And so many times, it’s just a way we’re thinking about ourselves that if I do all these things for everyone else then they’ll love me, or I am a good mother, and since I’m working all the time, I must do this. And it really is just thoughts that our mind is offering in those moments that talk us out of putting ourselves first. But if you can take some time to be as introspective as this person was who offered the question, is that she really realizes that’s he’s not making that commitment. And it will take some discomfort, people. We shift and do something new, it is absolutely not totally comfortable. But what I want to promise you in all the things we’re talking about today, that if you make a decision and honor it in some way on your calendar and allow the mind-chatter when you do those new activities, whether it’s working out, shopping, food prep, any one thing that you know you’d like to do, you’re going to get some discomfort in your brain because it’s new. And it’s like, wait, why aren’t you just sitting on the couch? Wait, why aren’t you at work? It’s trying to protect you and trying to keep you in what is routine. The brain loves routine. So, if it’s hard for you to put yourself first, make a commitment and know that it will be uncomfortable for a while, but what you may notice, and I notice this with my family, is they never expected me to do those things in the first place. And they were actually thrilled when I did. I’ll never forget this and it was a little less out of priority, but this also can come when you are making a brave decision to lose weight and you’ve done it a lot very publicly, at least in your family. It might be really hard to start taking those actions again because you might feel like you’re being watched or might let your family down. This is a nuance of not being able to put yourself first because you just don’t want to put yourself out there and try again. Well, I’ll never forget the first day I chose to do Weight Watchers. And I had not done anything around my weight that was practical. I respect Weight Watchers. It is not what I coach, but at that point, I had done nothing for myself around taking care of myself around food. And I had been really brave and thinking about it for a while. But I didn’t know how to count points and I was going to do what they said for the season. And it worked for me in getting rolling with it. And I remember hiding my book under the table when I was out to eat with my son and my husband. And then I realized that was kind of silly. They love me, it’s fine, right? And they were my cheerleaders every time I weighed in and I actually think bringing people in that’s support you when you’re doing something new, not as an accountability, that’s up to you, that’s like your business, right, but letting them be your cheerleaders. And that’s how they showed up for me, and so I let them in on the journey. It was really fun. Okay, I’ve gotten off track just a little. Another topic that came up in this breakfast roundtable and in my email was, “I really want to want to do it.” And this is really, how can I want to be motivated? It’s really asking, how do I either stay motivated, but how do I create that energy? Well, okay, when it comes to working out, and even for me, fresh cooking was something I resisted for a long period of time, and I’ve had a journey around that as well. But we want it to be easy. We want to be motivated and create the action, because when we’re motivated and we have a lot of positive energy, we will do something. We make these reasons to kind of protect ourselves, we deflate our own motivation. But when we make that step of wanting to, we really are going to be a little uncomfortable for a while, but what I want to offer and what I would offer if you were my client, which you are right now, you’re on the other side of this mic, if you wanted to be motivated around losing weight, I would say you can create that anytime you want. And I’m like, isn’t that fascinating, so that’s why you’re not. When you entertain and indulge in a thought and also define yourself in a way, like I don’t cook, you will literally create so much energy against cooking that you won’t get creative. But if there is also another thought, another belief that this is something good for you, you can start unwrapping that. So notice why you don’t want to do something and then choose the emotion that motivates you. And I’ll give an example, just because it’s not a two-way conversation and there may be some things coming up for you, so if you have questions after this podcast, I’d love to hear them. We can create an entirely new podcast on another set of Q&A. But what I would say in that moment is, pick an emotion. And one for me that creates a lot of action is pride. So I would say, if that’s what my client brought up, I would say, what is a way that you’re proud around how you treat food or how you cook? And it’s like, I’m proud because I’m willing to try something new, I’m willing to try new recipes. Even the thought, I am willing to do something new, for that client pride, and pride got her moving more than it stopped her. And those other thoughts may come up, but what you’re doing is creating belief in a new thought; a new thought that creates great yummy motivating emotion and gets you moving into action. This is one of my favorite things is literally believing that things are already done, like if I want to be a runner, I just believe, like, what would a runner do today? How would a runner feel about running? How would a runner feel about it if it’s raining? Do you see these examples? They’re perfect. So, you want to want to do it. Pick an emotion you love and a thought that creates that emotion around that subject and go. Alright, one other topic that came up during this, and I think it’s really important to stop, it’s one thing that I offer in all of my workshops, and we do really want to be motivated. So there’s several steps, but I want to help you to see something. One reason that New Year’s resolutions work for a time, like the gym is really crowded in January but it dwindles in mid-February, is some of those obstacle thoughts that I’ve been sharing with you, like I abandon my CEO responsibility if I work out or it’s too hard to food prep on Sundays, or any of those thoughts that come up, those are running in the background probably most of the time, unless you’re doing some very serious mindset work with a coach or in self-coaching. Those are operating in the background all the time. They’re kind of a subset of your common beliefs and thoughts, and that’s just the brain doing its job, being routine and thinking the same things. And in January, we give all this energy, the world is talking about your resolution, even if you don’t have one, you make on up, right, half the time. I know there’s a lot of pressure. I don’t like them and this is why, that you don’t get to the bottom of what’s keeping you from that in a natural way. You’re using all this energy – and I’m making a wave here, I wish you could see me. But you’re making a wave. When it’s January, that motivation goes over all those obstacle thoughts and lands on the other side. It’s fascinating. But then, real life happens and you don’t have as much energy – you have good energy, but you don’t have the same energy, you’re not in New Year’s resolution mode, you’re not in 21-day challenge and your officemates are challenging you. This is why I don’t recommend big challenges. I recommend thought work and mindset work so that you get rid of those blocks to your motivation. So, think of this wave going over this wall of bricks and now you’re taking each brick off. We’re doing this in the podcast today. It’s like, I don’t have time. Okay, that’s a thought. That creates resistance. How can I find time? Take the brick off. Oh, I’m not an exerciser; that creates a pullback emotion. That’s a thought. That thought isn’t serving me; I’m learning how to be an exerciser. And so, literally if you want to be motivated in a consistent way to create that traction, you’re going to have to look at those thoughts. And the simplest way to do that is if you’re not doing what you most want to be doing, just ask yourself why. And every thought that creates the pullback emotion, that resistance, will come up. Write them down and go, are those thoughts serving me? This is the essence of self-coaching. I’ll have a quick thought work sheet in the show notes for you so you can see this laid out. And I’ll actually lay out that chart, that brick, the motivation brick. So I’ll give you those two little pieces, so please sign up for those. You know, my show notes are always there. You can find them on my website. If there’s a particular episode or you want to even browse, it’s dianamurphycoaching.com/ceo27. But if you search on my website, you can find every recent title and scroll through them and they have my show notes right there and you can click through if you want any of the backup work, if you really want to dig in and do these things on your own. One last question, and I want to handle all these because this is just a beautiful way that I actually honor every person that came to that workshop. I can’t wait to share this podcast episode with them. Alright, so one of the other questions was, “I have to make very clean choices with my food,” because this gal had some very high-inflammation issues with trigger foods more than any normal human being. Like, this is something that’s going on in her body. This isn’t saying, like, don’t eat gluten because the world thinks we shouldn’t eat gluten. This is where she is literally finding form her blood work, and she’s working with very serious issues around inflammation. And she wants to keep making clean choices. But can you see from our discussion so far that there could be some thoughts, like it’s hard to do, I can’t ask the server to make a limitation, they always put butter in things in restaurants, so I can’t ask them to bring it back. And I’m talking just broadly. I’m not even talking to that one person. I hear this conversation all the time that we’re afraid to kind of step up and ask for what we want. We don’t want to be a nuisance. Those are just thoughts that are creating – they kind of come from us wanting to be polite, not making an effort, and this might be a place where you just need to be brave. So, making clean choices with food will take a commitment. It will take a commitment to make sure you shop for them. If you really are making a level-up on your food, it will be deciding what those clean choices are, shopping for them, and letting your brain. What are my clean choices and how can I find them? Put your brain to work. Asking a good question here kind of gets you past your own being polite versus being fully committed. So, my suggestion, when you are up-leveling or have some issues with food and have to ask for limitations, really in the back of your mind, if you were severely allergic to it, which basically this is what this is, if you were really allergic to something, wouldn’t you make sure it was not in your prepared food? And restaurants are accommodating this all over the place because things are happening in our food stuff. So, it is making that commitment, being kind to yourself that you want to be polite, but staying committed to what you want and putting your brain to work. What are ways I can create easy clean choices? And restaurants will come to mind that are easier, and also, you’ll shop better. Alright, so there was one other discussion that – I don’t want to take too long in this podcast but it’s one that I think would be really fun to close with, and this is the shoulds. In our world around food and exercise have so many opinions it is wearing us out. This is where leaning into intuitive eating can be so powerful, because we have so many differing opinions, so much advice, and those should be when our mind go, you shouldn’t eat gluten, you should work out five days a week. And if you’re traveling and you haven’t even been told you shouldn’t eat gluten and you have all these rules in your head, you go into the airport and you are totally overwhelmed because, first of all, you’re on a trip, there’s no way you’re going to work out five times. You’re hoping you’ll workout three. And then you have this other rule that you heard this morning that you shouldn’t eat gluten and you can’t find a thing that you like and you’re a little confused, like what does that even look like and why would I do that? So, this is an opportunity, when you’re hearing a should in your mind, this is an opportunity to stop and say, wow that should, is that serving me? And some of the shoulds are good. You shouldn’t cross the street if a car is coming. There are some shoulds that help us. And this is how our brain is wired, to protect us. But this is something else I see. Our shoulds come from wanting to be really good at something. And this is what I mean; we will set out to be, I’m going to be really eating clean all week. And we’re not specific about what that means to us. So our brain is joining the program and is joining the shoulds. And we do all the things. And again, this comes back to the motivation issue. But we are really wired to be all or nothing people, and if we listen to shoulds and then we don’t do the one thing, then we don’t do anything. This is why shoulds don’t work. You should work out seven days a week is insane. I am very athletic, very fit, and I just know when my body wants to move and not. And I’m onto myself when it’s brain-chatter because I’m just in this no drama place of planning my workouts and I know what my brain is up to. It’s like, oh you didn’t work out last night, didn’t that feel good to have extra time off and be like, no, I need a sweat tonight. But if I always thought that I should work out seven days, you know, the way I work out, I would probably injure myself. That’s not honoring my body’s wisdom. That’s not getting to what really works for me. So, those shoulds cause the all or nothing, so if I don’t do the seven days then I’m not doing enough. That’s baloney, right? That’s just the brain. Another reason that we do shoulds, and I follow this a lot because I’m a first child, is I’m a rule-follower. Well I should. Well, question your shoulds. Or we love being perfect. If I’m perfect at this, then that was a reason that you should do it. You’ve made this list at being perfect. It’s almost that unintentional thinking again. And another should is really pleasing others. But then, when we’ve pleased others by doing something, we plant that same thought in our mind, and that’s where we can take responsibility that we’re thinking the statement, you should work out seven days, when you know it’s not wise for you to do that. And it’s like, why am I thinking that? No, I’m thinking my commitment is I’m going to work out a minimum of three and I’m putting them in my calendar. Do you see how different that makes you feel? You should work out five days, or I love working out five days. I’m going to plan three non-negotiable appointments to work out and I’m going to look at these other opportunities with my workday and get it done. We are all or nothing ourselves into nothing and taking action around wellness. And if there’s anything to preach in this podcast to you today, it’s when you are resisting or not taking action in any area of wellness, calmly just stop. Do not judge yourself. Do not think anything’s gone wrong. Quietly ask, how am I feeling? Write it down. Why? Look at that thought and is that helping you? Is that serving you to think that thought? Like the ugly thought, the best example is, if I work out, I’m abandoning my CEO responsibilities. Is that thought serving her? We can see that it isn’t. But when it’s in her mind, she needs to step back from it, not have any judgment about how good of a CEO she is, and step back and say, that’s not serving me to think that, actually I’m learning to work out more to fuel my business. Can you see the difference? We can put our brain to work, but we must know what is going on. And that is the beauty of self-coaching. I hope I’ve given you a taste of it today. I hope that you, from this episode, will really take some time to ask more whys and move yourself out of self-judgment. Get curious. If you have any questions whatsoever, please send me an email. I’d love to keep, almost every 90 days, get an opportunity to do a Q&A, so bring it on and just put Diana@dianamurphycoaching.com, and put question. Once I have enough to do a podcast – and believe me, I pick up enough of this from my coaching conversations, that when I get some momentum, you’re going to see some Q&A calls and you’re going to hear your question answered. And in the meantime, you know what, I take about half an hour a week to look at my email to make sure, if there are some listeners asking questions, I’m getting back to you. So be bold. Ask the coach a question. I hope you’ve enjoyed the podcast today. I have had a lot of fun bringing this to you and I look forward to next week. Have a great day.